This version of the Vixen Optics Berlebach UNI 28 Tripod is designed specifically to carry the Takahashi EM-200 mount. It is constructed from solid ash wood, which gives it natural vibration suppression to ensure clear views even when there are people walking around the mount or windy conditions. 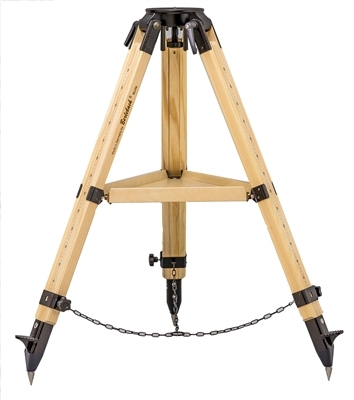 This tripod is designed with a set of versatile stop-less leg locks, which allow each leg to be set at any angle from 0° to 23° with the matching wood accessory tray installed. An integrated steel chain limits leg spread for situations that require increased stability. With the tray and chain removed, the legs can spread wider apart for use on especially rough or uneven terrain. 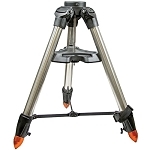 Each of the legs is tipped with a spiked foot that is capped with a rubber tip that give the tripod a sure footing on soft ground or hard surfaces. With a maximum load capacity of 110 pounds, the tripod will easily carry the mount and most small to larger medium sized optical tube assemblies of all configurations, plus accessories such as imaging gear. 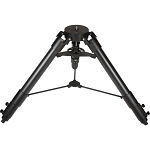 To accommodate a wide variety of users and telescope styles, the tripod is capable of standing between 39 and 64" for optimum eyepiece accessibility, with a folded length of 43" for easy transportation and storage. The weight is just under 20 pounds. The tripod also features durable spiked feet and an integrated bubble level. Box Dimensions (LxWxH) 44.0 x 17.65 x 11.0"